This is the art of my 3-year old. In a lot of ways, I wish I was more like her. She had an idea, and she went for it. She didn’t hesitate. She didn’t question her method. She didn’t wonder if other people would like it or not. She had something in her that needed expressing. 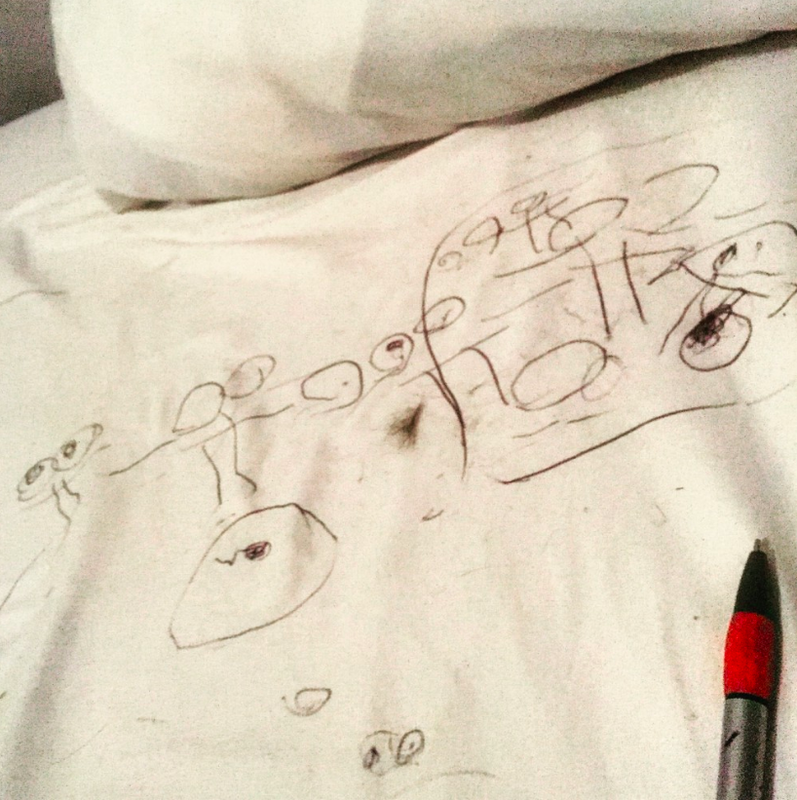 She put pen to sheets and went for it. As artists, we HAVE to put something out there. There’s something in us, itching, begging, screaming to get out. But as adults, we lose that immediacy. We obsess over it. What will people think? How will it be perceived? We try to perfect it in our minds. We second guess ourselves. We sit on it. We wait for the perfect time to release it. And then somewhere along our creator’s journey, this brilliant idea we had is no longer great. We’ve talked ourselves out of it. And now we’re struggling to come up with something we think people will like. This is where I always run into problems. When I’m creating for someone else’s approval, I’m never creating work that I’m happy with. My genius, original ideas morph into a mold to fit a generic audience. My original, specific message gets watered down and I lose my personal point of view. And then it’s not about the work anymore. It’s about how many likes do I have? How many shares? How many comments? How many views? If I’m creating art for someone other than myself, is it really my art? Whatever is in us that is trying desperately to escape, whatever art that is buried beneath our need for others’ approval, is our own, very personal truth. By releasing our truth artistically, we honor ourselves. When we create art with the intention of getting approval, we’re throwing a blanket on our gifts. We’re telling ourselves that our voice, our ideas, don’t matter. By hiding our gifts we are denying other people the privilege of connecting and relating to us. We don’t know how our, personal, art may touch someone we don’t even know. We want to create art to be seen, heard and felt by others. We want others to resonate with our work. We want to connect. We want to know that our work means something to other people, its changed them, its touched them somehow. But we don’t want our work to resonate with everyone. It can’t. It shouldn’t. We are not here to please everyone. We want our work to touch the few souls who are like us. The few humans who by reading our work, hearing our music, seeing our paintings are inspired to change, create, love. ← Can We Create Transformation?